Elements of the US missile defense system are to be put in operation in Romania (a country in Eastern Europe) already in 2015, an official spokesman for the US State Department said. was a "first step" in terms of the new anti-missile shield architecture, which would later also include ship-based interceptors in the Black Sea, US State Department spokesman Philip Crowley said. The choice that Romania made, will expand missile defense system in the south of Europe, Interfax reports. In addition, the USA continues negotiations with other countries of Europe – Poland, for example. Romanian President Traian Basescu said the country's top security body had accepted Mr. Obama's invitation to host parts of the American anti-missile defense shield. Mr. Basescu stressed that the system was aimed against threats coming from countries such as Iran, not Russia, in anticipation of potential criticism from Moscow. Which could be the targets for interceptor missiles in Romania? North Korea is too far. The distance from Romania to Iran is closer than from Poland or the Czech Republic, but the rogue state is too far anyway. NATO has such a member as Turkey, which borders on Iran. Why not building a missile base there? Russia is very close. There are about 500 kilometers between Romania and Russia’s major naval base in Sevastopol. Russia’s southern areas are close too. Even if the missile base is not going to be a threat to Russia, as the Romanian president said, Russia is not thrilled about such a neighborhood. 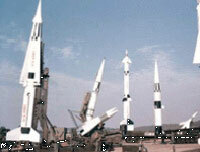 Romania was prepared to provide its territory for the missile defense system several years ago. In 2005, Romania was mentioned as a location for CIA’s secret prisons. President Basescu did not feel shy to call the United States Romania’s main strategic partner. One has to give Basescu credit for his determination as a politician. Romania became a member of the European Union in 2007 despite such deviations from the rules as an extremely low living standard. The deployment of US military objects in Romania will not improve security in the region, but US and Romanian officials do not seem to care much about it.